← Take Time to Live! Farming the old fashioned way. The team of four horses of Bruce Coleman’s friend turn the furrow on the oat field. There’s a strange absence of sound as the plow turns the golden oat stubble under. No roaring tractor motor to shut out the wind blowing steady this beautiful fall day. Bruce Coleman’s dog trots ahead of the team of horses turning the black soil up. It’s so peaceful. This is how Bruce’s father farmed years ago in southern Alberta. This is how my grandfather plowed in his time, back in Switzerland. “We absolutely love it,” Bruce tells me when I stop to take some pictures. 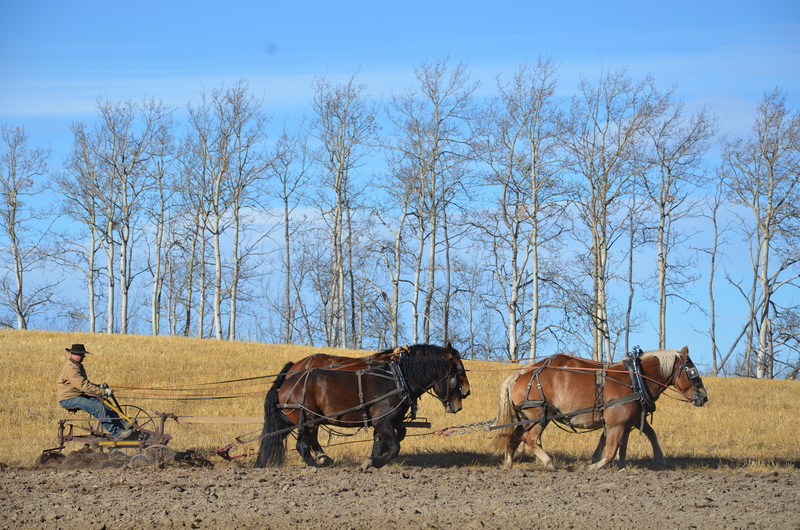 Farming with horses is a hobby for Bruce and his friend who plows on the other side of the small field with a team of four horses. They harvested 23 acres of oats on this field, the old way – cutting with a binder and horses, stooking the sheaves, then threshing with an old fashioned thresher. They also put up 140 acres of hay using horses. The hay and oats feeds the horses throughout the year. No, it’s not Remembrance Day yet. But it was a day to remember. country was built up on,” as Bruce told me. I drove by this stooked field of oats on my way back to Westlock. I missed the threshing bee by a few hours! My Dad on the tractor drawn binder in l964 or l965. Note the pile of bundles to his right, that will be dropped when there is enough for a stook. owned by a neighbour that took it to one farm after another. with the big machines now. The 1927 McCormick-Deering tractor and McCormick threshing machine are set up, waiting for the work to begin. There’s even a small wooden grain cart there. threshing bee, but others stopped in while driving down the highway, out of curiosity. through to make it arable, about giving the land with the respect due it.